Dash Clear Vinyl P-F Exam Gloves. Dash vinyl pf gloves are a non-latex and powder free solution for glove users who require exceptional tactile sensitivity. A specially formulated polymer coating on the interior provides for easier donning. 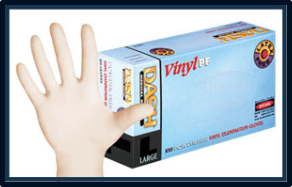 Dash vinyl pf also works great when mixing impressions or other materials that may stick to latex gloves.